Shah Gilani just shared with you the best way to profit from the "old" media companies right now. Because they have the fundamentals, assets, and qualities that Shah looks for in a great investment. Even better, Shah's identified FOUR other companies that meet similar criteria for explosive profit potential. In fact, they are even better. Because these companies could hand you triple-digit gains in as little as two weeks. He calls them "Hyper Trades," because they could amplify your profits up to 15 times over. 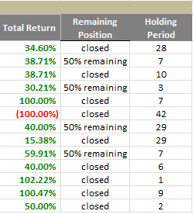 Each trade recommendation only takes about 30 seconds to execute. And it's as easy as clicking on a tab in your brokerage account and making a set of selections from a series of drop-down menus. That's it. This is EASY money, maybe the easiest money you'll ever make. And his track record proves it. The last three hyper trades Shah issued were his biggest yet, including a 102% gain in one day, a 100% gain in nine days, and a 50% gain in two days. And next week, starting on Sept. 24, he'll be issuing four more. Learn how to receive them first by clicking here. And hurry – due to the nature of these trades, the fewer people that get into them, the better they tend to do. And as a Fast Profits Member, you're getting this opportunity before most. Sell one-third of your position once you reach a 50% gain. Sell one-third of your position once you reach a 100% gain. Sell the remaining portion of your position once you reach a 150% gain. Buy CBS Dec. 21, 2018 $60 calls (CBS181221C00060000). Look to pay around $1.60. For maximum profits, sell your calls once you reach a 125% gain. Can one make your recommended play with a single call?